Antique Bench Ends. includes center strap. sections of minor rust. Original Antique Gothic Victorian Cast Iron Foot Stool, Gorgeous Ornate Detail! Antique, highly ornate cast iron base parlor foot stool with original porcelain caster roller wheels. Recently reupholstered with wine and gold floral fabric over the original stuffed muslin cushion. The cast iron bases are over 100 years old, but the wood seat is refurbished. ANTIQUE VICTORIAN PIANO STOOL TABLE TALON CLAW CAST IRON ORNATE FEET GLASS BALLS. Set of four plus three extra all for one money. 3 5/8" high and 3/4" round mounting hole. Ornate cast iron base in very good condition. Has cast iron base / legs. Solid and Firm. Words used such as Original, or reproduction, or the style of, or made by. And including a variety of reason. Los Angeles Area (Santa Ana, CA 92705). Great old set of legs, condition as described above. Solid and Firm. Words used such as Original, or reproduction, or the style of, or made by. And including a variety of reason. Have a table/ bench you planned to make?. Bolt these cast iron coffee table size legs onto it. Put a pipe across the bottom for a neat look. 15 3/4" tall, 15 3/4" wide, 3" deep. Gold gilt raised lettering. This gorgeous original piece features claw feet and ornate details, the center vignette depicts a pan or boy dancing playing a flute. The original (?). fabric remains with being a green velvet / upholstery. 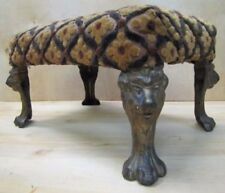 For your consideration is a lovely antique ottoman with cast iron legs in the form of a Sphinx. I'm not certain if the upholstery is original but it would be easy to replace. Item: Antique Ottoman. With golden hue all over the cast iron base. 20" wide from leg to leg. You can easily recover the material to anything you want! Dont be shy. smooth swivel too. This chair is one of a kind hard to find. Walk to the back of the plaza. Hand made very special turn of the century. Antique Signed J H Riggs cast iron piano or bar stool adjustable base stand. 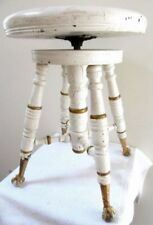 Up for sale is a Vintage Porcelain/Cast Iron Base Ice Cream Parlor / Soda Fountain Stool. It has a brass foot rest. It is about 27-1/4 tall. This stool does need to be cleaned and does have rust, marks and chips in the porcelain. Please see pictures for condition. BEAUTIFUL ANTIQUE Wood & Cast Iron Claw Foot Legs, Adjustable Swivel Piano/Organ Stool~VICTORIAN PIANO STOOL~Vanity or Desk Stool. This is NOT new, it will have normal aging, flaws, scratches, scuffs, marks and signs of use. Foot Stool with Double Cornucopia Motif. Seville Studios. The label is mostly gone as shown. Antique piano stool. Covered in crushed velvet type material. Wood base roped?. ~ In original finish with original wood seat. W : 24.75 ” x. H : 21.25 ” x. AGE / ORIGIN . Pair of Vintage Bolt Down Diner Swivel Bar Stools. 25" Seat Height. 13" Seat Width. Most antique collectors appreciate these little residuals of age. I use high-resolution photos, taken from many angles & perspectives. Antique foot stool- Petite Cast Iron Antique Lyre End Bench or piano/vanity seat with Cherubs tapestry. The cast iron lyre end panels are marked “OWI 106”. 20” long x 10”deep, and is 14” tall. EACHPHOTO IS WORTH A THOUSAND WORDS AND THEY ARE OF THE EXACT ITEM YOU WILL RECEIVE. Up for sale is this nice Victorian cast iron stool. Measure 14 by 11 in wide. 9 in tall. Original condition with good old fabric. NYS buyers to add 8% sales tax unless have valid resale number. Trolley Car Cast Iron & Wood Seat Conductor. ANTIQUE Nickle Plate Mfg. Co. Chicago, Train /. Lining Up Slot. Great Piece Of Early 1900's. Seat Does Swivel And Can Be Removed By. This stool needs to be mounted to the floor. I refurbish the footstool but always leave the original finish to maintain the integrity. In this case, I DID PAINT THIS FOOTSTOOL FOR IT HAD BEEN PAINTED RED! Up for your consideration is this BEAUTIFUL ANTIQUE VICTORIAN CAST IRON FOOTSTOOL WITH TIGER PRINT VERY HIGH-END DESIGNER SILK VELVET FABRIC. Bench Legs. 5 slats on the bottom and 2 on the top. Kennedy Machines Co is stamped on the bottom. Fringed fabric seat is torn, but tacked to the seat. Needs paint and tightening of one of the legs. Knobs underneath are place sporadically around the stool.Needs TLC. I refurbish the footstool and leave the finish as is to maintain the integrity of the item. I only paint if it has been previously painted. I did not paint this footstool but the underside shows a darker finish. Has a little wobble but is still pretty sturdy I dont know if it can be tightened with the right tool or not ?. This footstool has a cast iron base. Rose and other raised detailing on it. Nice look of carved legs on the piece with how the cast iron base was done. Would guess that this piece dates to the late 1800s, to early 1900s. Each leg is marked "W.H. Howell Co. - Geneva, ILL - Pat Applied". On each side is an emblem marked "Pat Applied for - 981". The bench is very sturdy the Iron is in good condition, the paint looks good. Rare Antique Cast Iron & Wood Industrial Counter Stool. Cast Iron Base Attached to Wood for Stability. Very Nice -- Heavy Piece -- Striking in Design. 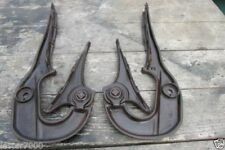 You are looking at a set of 2 original box car antique cast iron swing seats. Beautiful bench in great shape! We are assuming it is not the original covering…much too pristine in our opinion. Bench is very strong, sturdy & it is in positively marvelous condition ~ we have never had a nicer one! The Iron is Finished in Black which Contrasts nicely with the Red Upholstery. The stool is made comfortable with arm rests, a diamond shaped cushion on the back, and a padded seat, all done in a red fabric that's similar to velvet.